Wash cherries and lay out to dry. When perfectly dry, spread a single layer on a cookie sheet you can fit in your freezer. (this way cherries won’t stick together as much). Remove cherries from freezer as you want to eat them. Pit cherries. If you don’t have a pitter, a plastic straw works well. This is messy job, however, so don’t wear your best clothes. Pack in small containers where you can fill almost to the top to keep air away from the fruit. Vacuum sealing works very well. Remove from freezer and thaw to use in pies, sauces and baking. Mix 3/4 cup sugar, butter, flour, salt, baking powder and milk. Place cherries in the bottom of a 9 inch square baking pan. Spread dough over cherries. In a small bowl, combine 1 cup sugar and cornstarch. Stir in boiling water. Pour mixture over dough. Bake at 350 degrees for 45 minutes. Serve warm with whipped cream or vanilla ice cream. Grease 12 muffin cups. In a large bowl, stir together the flour, brown sugar, wheat germ, baking powder and baking soda. In a small bowl, stir the cherries and sugar together. In a medium bowl, stir together the orange juice, oil, egg, orange peel and vanilla blended. Make a well in the center of the dry ingredients; add the cherry mixture and stir just to combine. Do not over mix. Fold in the pecans. Spoon batter into muffin cups, filling them 2/3 full. Bake 15 to 20 minutes or until a cake tester inserted in the center of a muffin comes out clean. Cool 5 minutes on a wire rack before removing from muffin cups. Combine all ingredients in a large bowl. Mix well, Arrange meat in a non-corrosive dish and cover with the marinade. Reserve the remaining marinade for future use. Do not reuse the marinade that has come into contact with raw meat. Mix flour, sugar, baking powder and salt in a medium bowl. Add butter pieces and cut into flour mixture with pastry blender or fork until mixture is crumbly. Add buttermilk and mix just until moistened. Form dough into ball. On lightly floured surface, pat dough into a flattened disk about 3/4-inch thick with a 2 1/2 inch round biscuit cutter, cut out 4 biscuits. Combine dough scraps and repeat to make 2 more biscuits. Arrange biscuits on ungreased baking sheet, and bake 18 to 20 minutes or until golden brown. Cool on a wire rack. Just before serving, whip heavy cream with powdered sugar until mixture holds soft peaks. To serve, cut biscuits horizontally in half. Place bottoms on serving plates, spoon cherry filling over shortcake and top with whipped cream. Cover with biscuit tops. Serves 6. Bring water to a boil in a medium saucepan; stir in rice. Partially cover, reduce heat, and simmer 1 hour or until tender. Drain; cool. Place rice, oranges, celery, cherries and turkey in a bowl. Combine orange juice concentrate and remaining ingredients; stir well with a whisk. Pour over rice mixture; toss well. Cover and chill. Place oven rack in middle of oven. Preheat oven to 400degrees. Butter ramekins (small ceramic baking dish such as used for crème brulee) and set aside. Add the fruit to the ramekins. Whisk together milk, cream, flour, eggs, egg yolk and salt until combined. Add sugar and vanilla to combine. Pour over fruit. Bake about 30 minutes or until puffed and golden. Garnish with vanilla ice cream or whipped cream and a sprig of mint. This recipe was given to us by one of our French patrons who took the recipe from “Angels on Earth Magazine”. Pit the cherries. If you don’t have a cherry pitter, a drinking straw works well to remove the pits. Note: For Holiday Cherry Pies, you can freeze the pitted Cherries (see freezing technique at top of this page) then thaw and use as indicated. Combine sugar, flour and salt salt in a large bowl. Toss thoroughly with Cherries. Prepare your 2 crust pie shell. I have had good luck with Betty Crocker (just add ice water) Pie Crust Mix. Pour Cherry mixture into prepared bottom crust. Clip small bits of butter and sporadically place among the filling. Top with lattice crust (or solid crust with vents cut and sprinkled with a little sugar). Cover edges with foil to keep them from getting to dark. Bake at 425 degrees for 40 minutes or until crust is golden brown and the filling is bubbling. In high altitudes bake at 400 degrees. Cool pie on wire rack and serve room temperature. Our neighbor, Pam, spoiled us last year with all sorts of cherry treats. Hands down the best were her Cherry Brownies. Pam actually makes her brownies from scratch but here’s the easy version. -One package of your favorite brownie mix. -When you're adding nuts (if you like nuts) add ½ cup (or more—experiment) of our coarsely chopped cherries. Try not to eat the whole batch by yourself in one sitting. They are extremely rich. Make Homemade Sweet Cherry Jam 30 Minutes! STEM and pit cherries. Finely chop or grind fruit. Measure exactly 2 cups prepared fruit into large bowl. Add lemon juice. Stir in sugar. Let stand 10 minutes; stir occasionally. FILL each container quickly to within 1/2 inch of top. Wipe off top edges of containers; quickly cover with lids. Let stand at room temperature 24 hours. Jam is now ready to use. Store in refrigerator up to 3 weeks or freeze up to 1 year. Thaw in refrigerator. Makes about 5 (1-cup) containers. Important Tip for Jam Recipes: To get exact level cup measures of sugar, spoon sugar into dry metal or plastic measuring cups, then level by scraping excess sugar from top of cup with a straight-edged knife. Pit the cherries and place them in a saucepan with water, one tablespoon of sugar and orange rind. Cook, covered over low heat, until tender. They are best very soft for an ice cream. Mix in the red currant jelly and allow it to melt. Puree the juices and fruit. You should have about one and a quarter cups of pulp. Let it cool completely. Bring the cream to boil. In a bowl, whisk the yolks with the remaining sugar until thick and gradually tip in the hot cream, stirring constantly. Return to a saucepan, heat and cook, stirring until you have a very light custard. Make sure it does not boil. Remove from the heat and flavor with vanilla. Cool, then chill the custard for an hour. 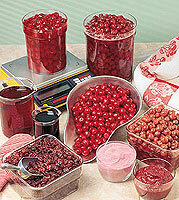 Mix with the cherry pulp and either freeze in an ice cream machine or in a tray in the freezer. If using a freezer tray, stir the set portions of ice cream from the edges into the center several times as it chills. Combine graham cracker crumbs, 1/4 cup of the sugar and melted butter in a mixing bowl; mix well. Press crumb mixture firmly into the bottom of a 9x9x2-inch baking pan. Let crust chill while preparing the rest of the ingredients. Put cream cheese, remaining 1/4 cup sugar, lemon peel and vanilla in a medium mixing bowl. Beat with an electric mixer on medium speed 2 to 3 minutes, or until smooth. Fold in whipped topping. Pour into prepared crust. Combine cherry filling and almond extract. Pour over cheese filling. Refrigerate, covered, ready to serve. Preheat oven to 375 degrees. In large bowl, cream together butter, Crisco, sugars and vanilla and almond extract. Beat until creamy. Beat in eggs. Gradually add flour, baking soda and salt. Mix well. Stir in chocolate chunks, cherries and nuts. Mix well. Drop by rounded spoonfuls onto greased cookie sheet. Bake 11-13 minutes. Cool on cookie sheet 2 minutes. Remove to rack and cool completely. Makes about 3 1/2 dozen cookies. Combine butter, brown sugar and granulated sugar in a large mixing bowl. Beat with an electric mixer on medium speed 3 to 4 minutes, or until creamy. Add eggs and vanilla; beat well. Combine flour, baking powder and salt, if desired; add to egg mixture. Stir in oats, cherries and chocolate chips; mix well. Drop by rounded tablespoonfuls onto an ungreased cookie sheet. Bake in a preheated 350-degree oven 10 to 12 minutes, or until golden brown. Let cool 1 minute on cookie sheet; remove to wire rack to cool completely. Store in a tightly covered container.